Synecdoche, New York is a masterpiece in high concept screenwriting. It is a movie about a man trying to discover capital-T Truth through a work of art, and is also at the same time that very work of art and a look at all such works of art. It presents the story of a man reaching towards infinity in his search for meaning, and through that presentation the film itself also takes part in that search and comments on it. It is a movie about looking for answers which is itself looking for answers and talking about what it's like not to find them. Synecdoche, New York is Caden Cotard's play and the review of that play. It is also perhaps the definition of the phrase "not for everyone". I said of Lost in Translation at the beginning of this week of reviews that if it was "your thing" then it might be the best movie you'll ever see. This is also true of Synecdoche, but so is the converse: if this isn't your thing then it might be the most dull movie you'll ever see. It does no pandering to the audience, and if you're not having fun there's a certain point of no return after which there's not much likelihood of recovery. The movie is at times overbearingly melancholic and depressive, and if you don't find yourself identifying with Philip Seymour Hoffman's character it's not likely to be a pleasant watch. Fortunately(?) for me, I'm also overbearingly melancholic and depressive at times, so I was pretty quickly on board with the tone. It's also a movie which is impossible to talk about without spoiling, so I'll stop messing about and give you my reading of the film. As much as I could bore you with my opinion of the minutia of the film's technical prowess, that's not really the point with this kind of movie. It's good. If you're interested in seeing it, do yourself a favor and go right ahead. My one complaint is that there's a sense of comedy in the first act which I wish were woven throughout, but I understand why it doesn't fit the finale. 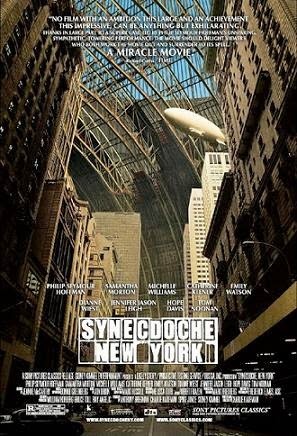 Synecdoche, New York is about the performative dimension of identity. It is about the fact that you are who you pretend to be (you are your performance), and that simultaneously you have to pretend to be who you are. Through our relationship with society and the public sphere (Lacan's Big Other) our fantasy/imaginary image of ourself (think The Matrix) remains trapped in our head and ceases to exist externally. No one can see what you think of yourself, so they think of you as the type of person who would do what they see you do (i.e. what you pretend to be). This is manifested in the movie through Caden Cotard and (for instance) his interaction with the various women in his life. He spends so much time in his head that the women he loves often don't know how he feels about them, and so the external reality of his emotional distance becomes their internal reality. They lose interest in him because he (accidentally) pretends not to like them. He is (to others) what he pretends to be. Conversely, in order to shape your image in the eye of society you have to pretend to be who you are. Because no one can see what you think of yourself, you have to artificially force yourself to do the things which define you. This idea first arises when Caden is directing Death of a Salesman. He tells the actor playing Willy Loman (a part PSH would play in 2012) that he should play the part not only as Willy Loman, a man who knows he's going to his lonely death, but also as a young stage actor who is similarly destined to die alone. Likewise, when the characters in Caden's magnum opus are given earpieces (particularly in the final scene) they seem to forget who they are and only exist through the instructed performance they are told to play out. He must be told (externally, artificially) what to do; he must pretend to be who he is. Welcome to Screening Notes, the analytical movie review site! I greatly appreciate comments, positive or negative, so please don't be afraid to speak your mind. Looking for a review of a specific movie? Try the search bar above (or at the top left of the page if that one is broken again) or browse an organized archive of my articles in the toolbar above. Like what you see? Use the links below to follow me on Letterboxd, Facebook, Twitter, or Tumblr! Please just ask if you want to use my analysis. I don't bite.